This article shows how to download a file from website to local disk programmatically on C#. The simple solution is to use WebClient class. There are two behavior of downloading a file: synchronously and asynchronously. Downloading a file synchronously will block main thread until the downloading is finished or any error occur (exception is thrown). On the contrary, downloading a file asynchronously won’t block the main thread. The main thread will continue while the file is being downloaded using thread resources that are automatically allocated from the thread pool. We use DownloadFile method of WebClient class to download file synchronously. The method accepts two parameter which is an URL (as System.Uri) of file to download and the local file name (as String) to save the download to. 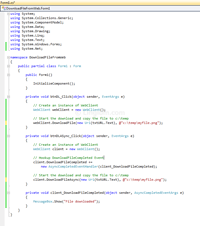 We use DownloadFileAsync method of WebClient class to download file asynchronously. The method accepts two parameter which is an URL (as System.Uri) of file to download and the local file name (as String) to save the download to. However, a file is being downloaded in background, we should add event handler to notify when the file download operation completes. To accomplish this, we add DownloadFileCompleted event to the WebClient object. You can download sample project at DownloadFileFromWeb. 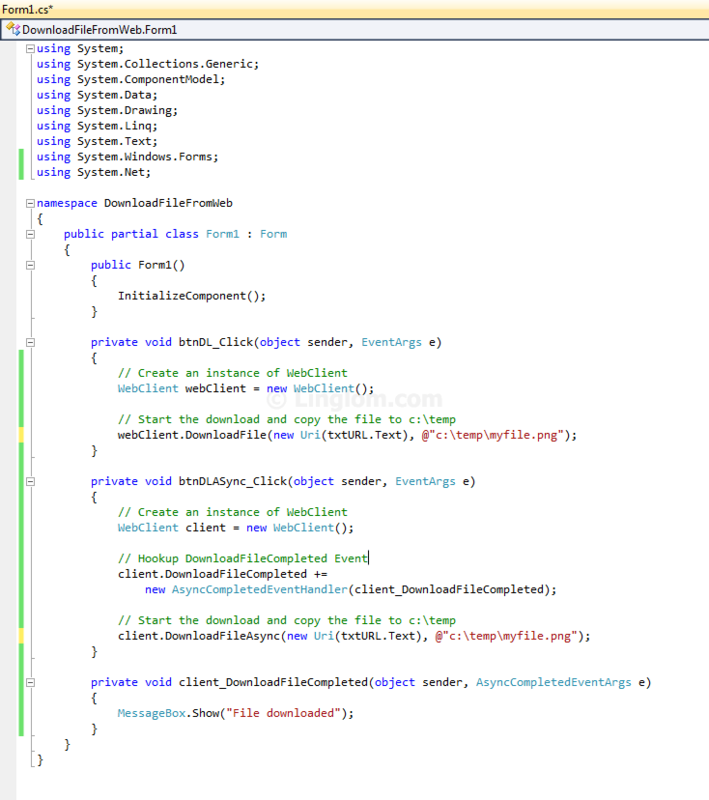 The source code is written as Windows application using C#, Visual Studio 2010.